Our Patron’s 2015 AGM address was the inspiration for the 50 Stories project and, as such, pre-dates the project guidelines. We hope you enjoy learning more about the connections between the Wensley family and the University. “What an absolute pleasure it is to be here, in this oh-so-familiar setting of The Women’s College and to be able to attend the Alumni Day and 2015 AGM, in my role as AFUQ Patron. “I was worried that I might not be able to do justice to it, at least initially, knowing that we had an equally busy time ahead of us, albeit of a different kind: sorting out and selling a house and garden in Canberra that we had not lived in-or been able to tend -for sixteen years, in order to move to Queensland; trying to reduce the clutter and accumulation of six decades of studying, living and working in many different locations around the world; and making some big decisions about where we would live and what we might do next. “For various personal and work reasons, including the serious illness of my brother Robert Wensley and my appointment to other roles, including as Chairman of the Council of the Australian Institute of Marine Science (AIMS), we haven’t made as much progress with the “de-cluttering” as planned-and for a few months yet, I will have to continue to be an “astronaut”, flying back and forth between Canberra and Queensland. So until we have completed our move back to Queensland later this year, I will have to ask you to be patient a while longer, with my inability to attend all the Association’s many functions and activities. “Happily, however, I am here today- thrilled at the prospect of being made an Honorary Life Member and equally thrilled to have been invited to be your Guest Speaker today. “When I received the documentation for the AGM, I discovered I was to speak on the topic ‘’From Alumnus of the Year to Patron of AFUQ”. My initial reaction was that perhaps (President) John (Martin) thought this would give me scope to talk about aspects of my diplomatic career-and also, of my time as Governor. And certainly, the span of seventeen years between those two points (between 1994 and 2011) was especially rich in interesting experiences. “By 1994, when I was named Alumnus of the Year, I had been in the Australian diplomatic service for 26 years and had already enjoyed a lively and fulfilling career, with postings to Paris, Mexico, Hong Kong, Geneva and as Australia’s Ambassador for the Environment. I had reached the level of Ambassador eight years earlier- in 1986-but in the remaining fourteen years of what turned out to be a forty year career-I came to hold more than a dozen more senior diplomatic appointments: some decidedly exotic-such as Australia’s first Ambassador to Bhutan and as Ambassador to Mauritania; some turbulent, most notably, as High Commissioner to India; and one-as Australia’s Ambassador to the UN New York, putting me at the very heart of global diplomacy, dealing with issues of immense importance to Australia-including the first Iraq War and the East Timor crisis. “And John’s time- line also covered four of the six years I served Queensland as its Governor-with plenty of interesting experiences to relate there also. But given my continuing involvement in public life and the possibility of my taking up other positions in Queensland in the future, perhaps it’s a little early to venture into that realm. Also, the more I thought about the suggested topic, and its idea of my journey between those two specified points, the more it led me to think, not so much about my career history and achievements, but about what was the basis-the foundation- for those, namely my education at this University-and what it was that led me to choose THIS University above others; and it also caused me to reflect more deeply about the Alumni Association and its role- from when it first began, in 1967,and now. So I concluded that what I really wanted to do today, was to use this opportunity to consider two different-but nevertheless associated- histories: that of Alumni Friends; and the other, my connections with the University, which go back much, much further than when I arrived here, as a wide-eyed fresher, in 1964. “I attended the University- and lived at this College- for four years, from 1964 to 1967, undertaking an Arts Honours Degree-achieving a First in English Language and Literature. But my decision to study at UQ was founded on much deeper, older roots-going back almost to the University’s own founding. “In those very early years of the University’s life, four members of my family-all McCullochs, all from Ipswich-enrolled to study at the University: my Great-Uncles Alf, Herb and Harold, and my Great-Aunt, Minnie McCulloch. “All four won Open Scholarships to the University. “Aunt Min did Senior in 1911 and began Uni. in 1912, the second year of its existence. The family could not afford to send her to Women’s College (her greatest regret). She studied Latin, Greek, Pure and Applied Maths and graduated with Third Class Honours in May 2015. “Uncle Herb came next. He completed Senior in 1914 and matriculated to the newly-minted University, where he took a Science degree, admitted as Bachelor of Science in May 1918. “Then followed Uncle Alf, who completed Senior, was School Captain and Dux of the Ipswich Grammar School in 1916, and decided Engineering was for him. After completing his first year in 1917, he enlisted in the AIF and volunteered for transfer to the AFC following an appeal for people with a technical background. He embarked for overseas as reinforcements for the 9th Battalion in June 1918 and was transferred to the AFC on 1st November. He was still encamped on the Salisbury Plain when the Armistice was signed. “Discharged from the Army in June, 1919, he returned to his studies, completing his second year studies in the remaining months of 1919. Alf was awarded the Sir Thomas McIlwraith Engineering Scholarship for 1921, on the recommendation of the Board of the Faculty of Engineering, which provided a year’s tuition for students about to complete their fourth year. In 1921 he was employed by the University as a Student Demonstrator and in June, 1922 was awarded a Bachelor of Mechanical and Electrical Engineering with First Class Honours. He completed his Master of Engineering in 1927, working full time throughout. “Uncle Harold won the Byrnes Medal in 1917, did Senior in 1919, and, following in his brother’s foot steps, graduated as a Bachelor of Engineering with First Class Honours in May 1924, then secured his Masters of Engineering in April 1928. “So that was the first generation of my family to study at UQ-not bad for the children of a ‘refugee’ from the Irish potato famine-who had little formal education, because, as he later explained, “’he was always at home digging the tatties”. “Doris completed Senior at St Hilda’s school in Southport in 1933, and matriculated to the Faculty of Arts. She was awarded a BA with First Class Honours English Language and Literature in April 1937. In December, 1936, she was appointed by the University Senate as the first woman tutor in Philosophy-then, in 1939, as Lecturer in Psychology in the Department of Philosophy. “She combined her tutoring in 1937, with her fourth year of studies, achieving First Class Honours in Philosophy in April 1938-and winning the University Gold Medal for outstanding academic merit. She was reappointed as Tutor in 1938-then given the status of Assistant Lecturer in 1939 and 1940. She was awarded her MA in 1940, having submitted a thesis entitled ‘The Philosophy of Dr Johnson as shown in his conversation and writings’’…..(and to my delight, as an extraordinarily thoughtful Mother’s Day gift, my eldest daughter some years ago obtained a copy of this thesis for me from UQ records). “Copies are wonderful to have- but originals are even better. (As I am sure any historians among you will agree). Recently, my brother Rob, who is sorting out all his papers, gave me some incredibly precious documents I had never seen before: original correspondence, on UQ letterhead, to Miss D.E. McCulloch BA, from the University Registrar, advising that the University Senate had approved a recommendation from the Faculty of Arts, that she be reappointed as Temporary Lecturer in Psychology in the Department of Philosophy for the year 1940, on the same terms and conditions as for 1939; and some original, hand-written references, also on UQ notepaper, from the Professor of Philosophy, Professor Kyle and former Professor of Philosophy, Scott Fletcher recommending my mother for a teaching position at the Glennie School (which she subsequently obtained). “My father, Neil Wensley (whose father came to Australia at 17- the youngest of 11 children, with no hope of making a living on the family farm in Northern Ireland, so lured by the tales of fortunes to be made in the Gold Fields of Charters Towers) completed Senior at Thornburgh College in Charters Towers, in 1933. He did this in difficult circumstances. Dad was a good and promising student, but when his father died in Yungaburra, at age 44, leaving his mother a widow with five children, he chose, (coincidentally the same age his father was when he set sail for Australia) at age 17, to leave school to work in the Mines, to support his mother and pay the school fees of his younger sisters, all attending Blackheath College. Dad thought he wouldn’t be able to go to University, so enrolled in Teacher’s College in Brisbane-but apparently found he wasn’t cut out for teaching-and returned to Thornburgh College in 1933, where he completed the two years of Senior in one year only, then headed back to Brisbane- this time on the right path for him, to UQ, to undertake a degree in Chemical Engineering. “The third generation of McCulloch’s and Wensley’s was mine- in the 1960’s: my cousin, Janet McCulloch, daughter of Alf, who graduated B.Sc in 1964; her cousin, Avis, daughter of Herb, who also studied Science; and me and my two brothers, Robert and Bill. “Robert- following in our father’s footsteps, obtained an honours degree, then a Masters in Chemical Engineering, then decided to go in a completely different direction, switching to the law, achieving honours (and ultimately becoming a QC). I followed the maternal example, with an Arts degree, matching my Mother’s First Class Honours in English Language and Literature, but not the philosophy-only studying that for the first two years of my degree. And unlike Mum, rather than pursue a Masters (maybe that’s somewhere still down the track), I opted for the work force and my diplomatic career; and our younger brother Bill, breaking away from that line of engineers, studied Commerce, graduating in the early 70’s. “With almost all the decades covered- from 1912, through the 20’s, 30’s, 40’s, 60’s and 70’s, I jump to the 90’s and the first decades of the new century- with the fourth generation: our eldest daughter, Sarah Wensley McCosker and her cousins, Robert’s second son, Tom and daughter, Kate Wensley. Sarah and Tom both chose Arts-Law, Sarah gaining double First Class Honours in Arts(English and French) and Law in 2001, and going on to do a Masters and her Doctorate at Oxford; and Tom studying at UQ between 2003 and 2011, completing his BA, majoring in sociology and political science, then following his Dad, completing a Bachelor of Laws. Kate completed a Bachelor of Psychological Science, 1999-2002 and later a Masters in Psychology (which she is putting into fine effect as a sport psychologist at the Australian Institute of Sport in Canberra). Tom is working on indigenous affairs, with an NGO, here in Queensland; and Sarah is a specialist in humanitarian law, working for the International Red Cross in Geneva. “All of those generations of graduates used their UQ degrees to get good jobs, but their University education wasn’t only about gaining formal qualifications-and this is part of my purpose in using my UQ family tree today as an alumni “model”- a template for thinking about the way personal histories- and stories- are what lie at the heart of the university. They are what inspire alumni to love this place- as I most certainly do- to feel gratitude and to want to stay connected….and as such, uncovering those stories should surely be a big part of the work of this association, dedicated to building those connections. “The UQ Motto-Scientia ac Labore-through knowledge and hard work- is a very practical one, its choice reportedly influenced by the views expressed by the pragmatic Premier William Kidston at the time of the University’s establishment. “But it doesn’t capture fully the idea of the university as a community, nor the richness that a university education can involve, beyond being an institution for higher learning, delivering degrees. “Many of you here this morning know how much I love words and relish exploring their origins. “The word University derives from the Latin “universitas magistrorum et scholarium”— meaning, roughly, community of teachers and scholars . “The key word-universitas- means “whole”, and it is that sense of the university being a community, offering a much larger, WHOLE experience for its students that I am drawn to-that I have always associated with university life. “And in saying this, once again I am influenced by that ‘UQ Family tree”-and by the experience of the several generations in my family who gained far more from university than their formal qualifications. “All of them were very active in student life: in college and on campus; in sport, the performing arts and student associations. Alf won a University half-blue for cricket and a blue for football. My father was in the UQ Rugby A Grade-team and later became President of the Sports Union (there’s a picture of him, taken in 1938, classic arms akimbo pose, in Volume 1 of the History of the University of Queensland Rugby Football Club- (showing the A Grade Premiers in 1938, Winners of the Doughty Premiership Shield)-for which I wrote a Foreword as Governor). “My parents both represented the University at Tennis. My cousin Janet McCulloch, was also involved with the tennis club and served as Treasurer of the Women’s Sports Union. “My brother, Robert, served as the first full-time student President of the University of Queensland Union in 1969 and 1970 and as Personal Assistant to the Chancellor, Sir Zelman Cowen from 1972 to 1976. (As a sign of changing times, his daughter Kate, represented the University in Soccer). “My own extra-curricular activities were focused largely on the college community, which offered an abundance of activities-debating, music, theatre, inter- college sports-but I was also involved with the larger UQ music community and the fun- which some of you no doubt shared- of Commem and the Commem parades. When I became Governor, there were some interesting searches conducted to dig up some old photos of me. Nothing too bad was located: one, in academic gown, singing Gaudeamus-in the city- I think in King George Square; and another, somewhat more revealing, where I was photographed standing on a WC (Women’s College) float, draped in a sheet, showing quite a lot of bare thigh, under a sign calling for ‘More Police Coverage’”. “As was our social life, including dances at Cloudland, where we also did some of our exams. Many Queenslanders were sad to see Cloudland demolished. I had more reason to regret its demise than most –as it was at Cloudland that I first danced with my future husband-Stuart McCosker. “When I was formally farewelled as Governor, by the University, and from my role as Official Visitor to the University, last year, I mentioned in my address that many people nowadays are interested in speed and online dating…but that we had had no need of either- because my family had UQ. “Three of the four generations of UQ students I have described found their life partners at UQ: my father met my mother at UQ; I met my husband, Stuart McCosker (whose family is another with very strong connections to the University) ; and our daughter met HER husband. So our UQ roots not only run deep, but that UQ family tree, now 103 years old, is flourishing and developing new branches, anchored solidly by the achievements of four generations-with many more, I hope, to follow- although we’ll have to wait a while for the next new shoots, as our grandson, Thomas Wensley McCosker Duong, is only seventeen months old! “I know other families-and perhaps some of you here today-may be able to track similar time-lines, but, in our case, beyond the academic and professional achievements that successive generations have achieved from the springboard of their UQ education, what pleases me most to recount—and what is most relevant to today’s gathering of Alumni Friends, founded to promote and further the interests of the University and to foster relations among its Alumni and the wider community- is that the University connections did not cease at graduation. Each of those generations has stayed connected-has continued to serve and support the University in various ways. “All worked actively to keep their connections with the University. After graduation, Alf served the University as an Honorary Lecturer in the Faculty of Engineering from 1939 to 1949. As Chief Engineer of the SEAQ, he encouraged a close relationship between the firm and the Electrical Engineering Department at the University. SEAQ funded some University research and sponsored the SEAQ Cadetship Scheme, whereby the Cadets had a year of experience with the SEAQ before they began their full-time University studies, as well as holiday work throughout their course. Alf served as Chairman of the Joint Appeal for the University of Queensland at the time when the Colleges were relocating to the St Lucia Campus, and also supported his old college with membership of the Kings College Council over many years. His commitment to- and support for the College-maintained by his daughters, Elisabeth and Janet, has been honoured in the naming of the McCulloch-Watson Terrace at the College. “Neil and Doris lived outside Queensland, Neil’s work as a munitions expert with the Commonwealth Government Department of Supply (later Defence Production), taking them to Victoria, New South Wales, the UK and the ACT, but the University had left an indelible mark on them and so-when it came to decisions about University for their children- they championed the cause of UQ, above all other options and made considerable sacrifices to enable them to study there, as well as to experience the college life they so valued. 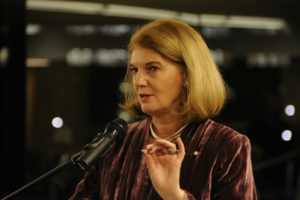 “Having also chosen a public service career that took me away from Queensland and, for significant periods, (years at a time), overseas, representing Australia, I could not be as involved with UQ as others in the family- but I cherished the links I was able to sustain, principally through the Alumni Association and the Women’s College, was delighted to be appointed an Adjunct Professor for a number of years and always seized whatever opportunities presented themselves to address UQ audiences and graduation ceremonies. One of the most memorable of these occasions was the ceremony at UQ where, as an Honorary Doctor of the University, I was invited to deliver the address to the graduates. Our daughter Sarah was the Valedictorian, and my brother, Robert, presided, as Deputy Chancellor. It was “touch and go” whether I could be there, as I was Australia’s High Commissioner to India at the time, based in New Delhi, and relations between India and Pakistan were very tense-on the brink of war, with the possibility of use of nuclear weapons-but I was given special permission from the Foreign Minister himself to travel to Brisbane- provided I returned to India as speedily as possible. But I made it-and it was an exceptional occasion, for all our family. “If I am proud of my post-graduation links with UQ, I am even prouder of those maintained throughout his life by my elder brother, Robert. Robert has served the University in many roles, including membership of several senior committees, faculty boards, University technology-transfer company boards and several residential college councils. He served as an elected member of the University Senate almost continuously from 1978 to 2009- one of its longest-serving members. He was appointed an adjunct Professor in the T.C. Beirne School of Law in 1999 and in the same year, was elected Deputy Chancellor- re-elected to the role in 2002. He was active in community relations and fundraising through the Alumni Association executive, the Senate Development Committee and as President of the University’s Annual Appeal. I never pass or step foot in the wonderful Customs Building, owned by the University, without breathing a silent thank-you to my brother for the role he played in advocating, and helping to secure, its acquisition. It is one of the jewels in the University’s diadem of wonderful buildings and an enormously important building in Brisbane and Queensland’s history. Rob-like me- is a Fellow of both the Kings and Women’s Colleges. He was Chairman of the Kings College Council, then of the Foundation. On retirement, he gave his Law Library to the College- and most recently- only last week, in fact- his life-long commitment to Kings was recognised with the decision to name the new college wing, “The Wensley Wing”, in his honour. “But back to 2008, when the then Premier of Queensland-herself a proud UQ graduate- asked me to return to Queensland to become Governor. When I accepted the position, I was unaware of the long established custom that the Governor become Official Visitor to the University-nor that this practice had lapsed for some years-but when Paul Greenfield wrote to me about this, I accepted with alacrity-as I did the subsequent invitation to me from the Alumni Friends, in 2011, to become the Association’s Patron, following the death of Sir Zelman Cowan, who held the position for an extraordinary 41 years. “Since 1967, when the Association was established, it has had only five Patrons and one Vice-Patron-and its membership-and fortunes- have fluctuated, under the pressures that seem to affect most voluntary organisations at one time or another: ageing membership, declining membership, coping with changes in operating costs, in technology, finding and keeping suitable premises, maintaining records. I’m sure all these challenges will be very familiar to most in this audience-especially the members of the Executive and Management Committee. And there has been the added difficulty, as the University has grown and changed in the way it, too, has to operate (becoming much larger, more complex and much less personal), of establishing and maintaining effective links, not just with the Alumni, but with the University administration-its leaders and key personnel. “Understanding these difficulties- seeing them first-hand during my time as Governor- I am admiring of the way the AFUQ’s own leaders have persisted and persevered and have kept faith with the Association’s founding principles. You have done well to maintain the sub-committees; you have made the bi-annual Book Fair an established feature of the University landscape; the Alumnus of the Year Awards-established in 1992 to mark the 25th Anniversary of the establishment of the Association- have grown in strength and prestige to serve, in some respects, as the Association’s Flagship activity; and quietly, without fuss or fanfare, you continue to raise sufficient funds to provide a steady flow of scholarships and bursaries to deserving students-a wonderful way to ‘give back’ to the University. “The attendance at today’s AGM is modest (about the usual turn-out for such meetings, I’m told, but nevertheless small, when you think of the hundreds and thousands of graduates who have gone out into the world from UQ); and the inability of the invited VIP’s from the University Leadership to be with us is also a little disappointing (although we are very pleased, as the outgoing President, John Martin, indicated at the outset, to have Ms Gina Wheatcroft here to represent them). But again, this is a reflection of the complexities and pressures of modern life-and of modern universities, as they continue to grow and change and adapt to new realities, losing much of that sense of community that animated and inspired the generations of students I have talked about today. “My purpose in so doing was not to bore you with a personal family history-but rather to cause you to think about the many similar stories that other families, other generations of Queenslanders could relate- with affection and gratitude-about their involvement with this University-and the way their university experience did not simply provide them with a formal qualification, but affected and shaped their lives profoundly-so profoundly that they WANTED to give back, in some way. It may have become a much larger and more sophisticated institution, of international prestige and standing, global in outreach and perspective (a very big business in today’s terms) but the heart of the university remains, I am convinced, with those individual stories. And it is vitally important, at this AGM, and as we are thinking of ways to strengthen and animate the Alumni Association (for that is surely our shared purpose and resolve), that we not lose sight of those individual stories, of that notion of community –and of the WHOLE experience that University should offer. This entry was posted in Family and tagged Connection, First Story, Patron, Wensley. Bookmark the permalink.